MNA – Iranian Foreign Minister Mohammad Javad Zarif referred to the long-standing, respectful and reciprocal relations between Tehran and the Holy See (Vatican City) and emphasized the need for dialogue and effective cooperation between religions and civilizations. Zarif made the remark on Wednesday, in a meeting with Vatican City’s Secretary for Relations with States Paul Richard Gallagher, who is in Tehran to hold talks with Iranian officials. He underlined that Iran respects the character and positions of the Pope. Talking about the regions critical conditions, the Iranian foreign minister underlined the need for peaceful solutions to overcome these crises, stressing that the world’s problem today is extremism, which is not limited to a special region. Zarif also referred to the issue of the Rohingya Muslims in Myanmar and called on all countries to cooperate and join hands to stop the massacre and mass expulsion of Muslims in the country. He also appreciated Vatican Citys efforts in this regard. Speaking about the crisis on the Korean Peninsula, the Iranian FM added that after the Cuban crisis the world has forgotten the danger of using these weapons, but again we are witnessing that this great danger is posing threats to the international community. In turn, Gallagher discussed the two sides shared views on regional developments and dialogue and cooperation to end regional crises, the refugee crisis, and extremism. He said Vatican City has supported the peaceful use of nuclear energy and Iran’s nuclear deal, and it still throws its weight behind it. “Encouraging the culture of peace and the peaceful coexistence of religions in the Middle East should be pursued with earnestness and Vatican City has always supported this coexistence between religions,” he added. 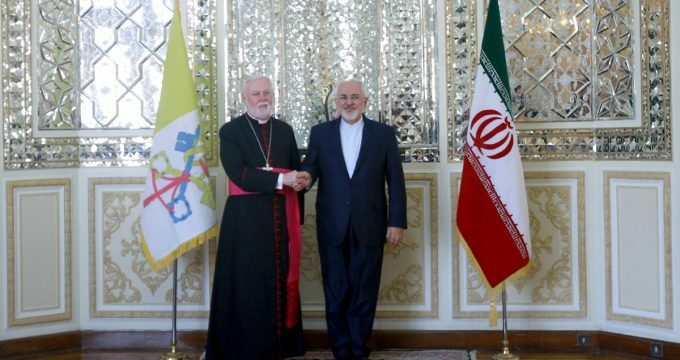 The foreign minister of the Islamic Republic of Iran and his counterpart from the Holy See also exchanged views on various political, social and inter-regional issues, expressing satisfaction with the process of dialogue between the two sides.